Is your house infested with gnats? These small, black, flying insects can become a real nuisance and getting rid of a gnat infestation can be extremely tricky. That’s because female adult gnats will lay eggs by the hundreds in damp soil, turning a few of these flying insects into an infestation in a couple of days. The term gnat is a broad term that describes many species of flies, including black flies, drain flies, phorid flies, fruit flies, and fungus gnats. Fruit flies and gnats are attracted to decaying organic matter, like rotten fruit and plant roots, which means you will most likely find these pest buzzing around your plants, trash can, and garbage disposal drains. Gnats love to live in cool, damp places, making the wet soil in your potted plants the perfect breeding grounds and food source for creating a gnat and fruit flies problem. How Do Gnats Infest a House? Can Essential Oils Work on a Gnat Infestation? How Can I Prevent a Gnat Infestation? Fruit flies and other types of gnats can enter your house through open doors and screens, and as eggs and larvae on fresh produce and in the soil of new plants. Once they find their way inside, gnats will start to feed on organic material and lay their eggs on overripe fruit and in the soil of your indoor plants. When the eggs hatch, the gnat larvae, and baby gnats will eat and develop in your rotten vegetables and fruit and moist potting soil, leading to a gnat and fruit flies problem that will be difficult to control. 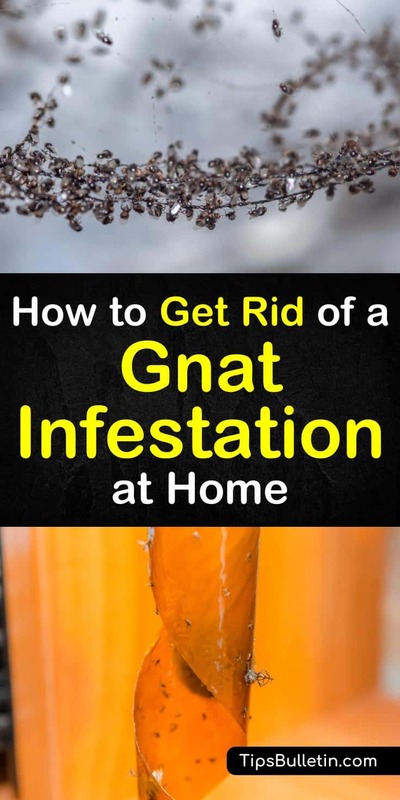 To rid your house of pesky gnats and fruit flies, and prevent a house flies infestation in your home, you can use several home remedies that can help you get rid of gnats. You can make your gnat trap using red wine or apple cider vinegar. This recipe may also be what repels spiders. Pour the red wine or vinegar in the container and add several drops of dish soap. Place several cups around the house where you have noticed the gnat problem. The sweet smell of the wine or vinegar will attract the gnats to the container. When the gnat bug flies down to feed on the liquid, the dish soap will cover the gnats wings and legs, leaving it unable to fly out of the container. Another effective gnat control technique is to make a sticky gnat trap out of colored paper and honey. Attach strips of the colored paper to sticks and smear the front of the paper with honey. Place the sticks in your soil to effectively kill gnats that are feeding on your plants and eliminate your fungus gnat infestation. Yes. Essential oils have long been used as an effective pest control method. Several essential oils are highly effective in dealing with a fungus gnat infestation. Essential oils have strong aromatic compounds known as terpenes. The compounds are the source of the natural and unique aromas that each oil has and are what repels spiders and other insects like fungal gnats. You can diffuse any of these essential oils in your home diffuser to get rid of gnat infestations in-house, or you can make a homemade gnat spray to get rid of gnats fast. Either technique will work for your gnat problem. Pour the white vinegar and water into the spray bottle. Add the essential oils. Place the cap back on the bottle and shake to mix the ingredients. Spray your surroundings with the spray to kill the gnats in your home. Preventing a gnat infestation in your home involves several steps to make sure that they don’t become a problem. Start by making sure that you don’t have any small holes in your window screens, and deal with any cracks or crevices around your window and door frames that might be letting these pesky fungus flies into your house. Next, make sure that all your potted plants contain bug-free potting soil and be sure to avoid giving them too much water. Overwatered plants end up with root rot, which is the food source of choice for baby gnats and fungus gnat larvae. Allow the soil of your indoor plants to dry out between watering to ensure the roots of your plants stay healthy and fungal growth in the soil is kept to a minimum. Effective fly control also means keeping all food containers, like your garbage cans, sink drains, and countertops clean and free of food so flies don’t have any food sources or places for their larvae to develop. This means getting rid of or storing fruit and other produce so that flies are unlikely to infest the food. When gnats and fruit flies infest your home, dealing with them can be incredibly frustrating. Even though they have a short life cycle of four weeks, if you don’t address the issue at the first signs of a problem, your house will quickly be infested with these annoying flying insects. 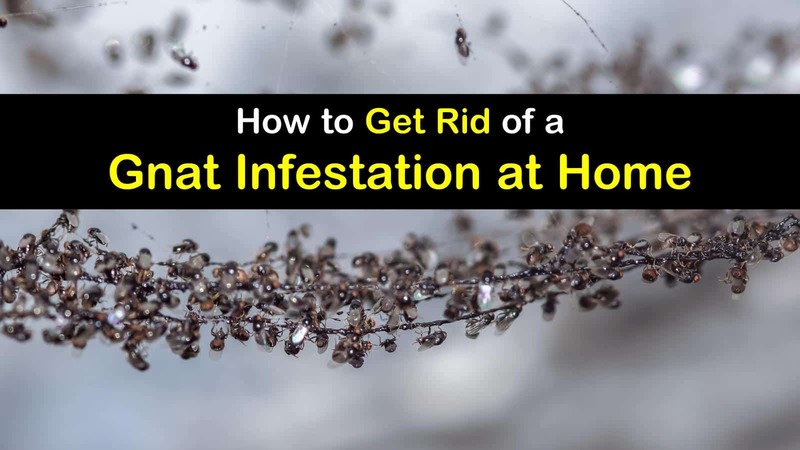 Make sure to keep your house clean and utilize these quick methods for dealing with a gnat infestation to keep your home free of these pests. We hope you enjoyed learning how to deal with a gnat infestation inside your home. If you found the information in this Q&A article helpful, please feel free to share it with your family and friends.